I joined the usual group for breakfast and had my usual oatmeal. We were all exhausted and ready to go home yet sad that the class was almost over. After breakfast, we listened to the morning lecture, which was about souffles and sauces. In the kitchen, the chef started out by demonstrating how to slice and shape Palmiers – our last puff pastry item. There’s more to it than just slice and bake: once on the pan, they need to be shaped a certain way and spread out far enough so that they have plenty of room to expand while baking – they spread out rather than up. Palmiers are like an Elephant Ear, but I hate to call them that because these were so much better (and not elephant sized) than what you’d find in a grocery store. Next the chef demonstrated a basic souffle, using his own recipe rather than the one in our class binder. The method for the base of the souffle is just like making pate a choux dough, then flavoring is added, egg whites folded in, and voila – ready to go in the oven. He made it look so easy, but I was skeptical. Along with the Palmiers and souffle, each team had to sign up to make a dessert sauce. This was going to be a busy day! In the kitchen, my partner and I started out with our Palmiers. Ours didn’t look quite as pro as the chef’s, but we knew that our puff pastry turned out well, so we weren’t concerned. Here they are on the pan. Next, it was Lemon Butter Sauce. Now, I haven’t complained about the other people in the class thus far, but I think it’s time for it now. My partner and I had our sauce on the stove and we were looking at it and discussing whether we thought it had reduced enough yet. Note that we were just talking to each other and not asking anyone else’s opinion. The guy on the burner next to us – who I had nicknamed Grumpy guy – stuck his head over our pot, grabbed a bowl of water and a pastry brush, and started brushing down the sides of our pot. While he was doing this, he explained that we needed to do that to prevent the sugar from crystallizing on the side of the pan. We remained calm on the outside and told him that nothing was crystallizing and we didn’t need to do that for this recipe. He said “you’re making caramel sauce, aren’t you?” We said no, it’s Lemon Butter Sauce and he quietly returned to his own burner. There was no harm done, but we could have been making something that would have been damaged by slopping water into it. He was making caramel sauce and burned it twice and had to have the chef help with the third attempt. Ha. Next it was lemon souffles. Our souffle base was lumpy so we had to push it through a strainer, which was messy and discouraging. 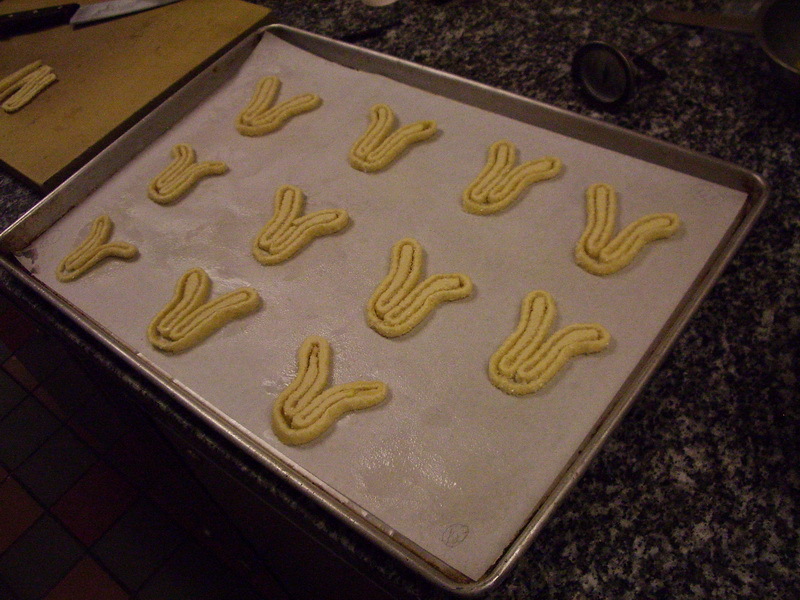 We weren’t expecting much, but finished the recipe and put them in the oven. 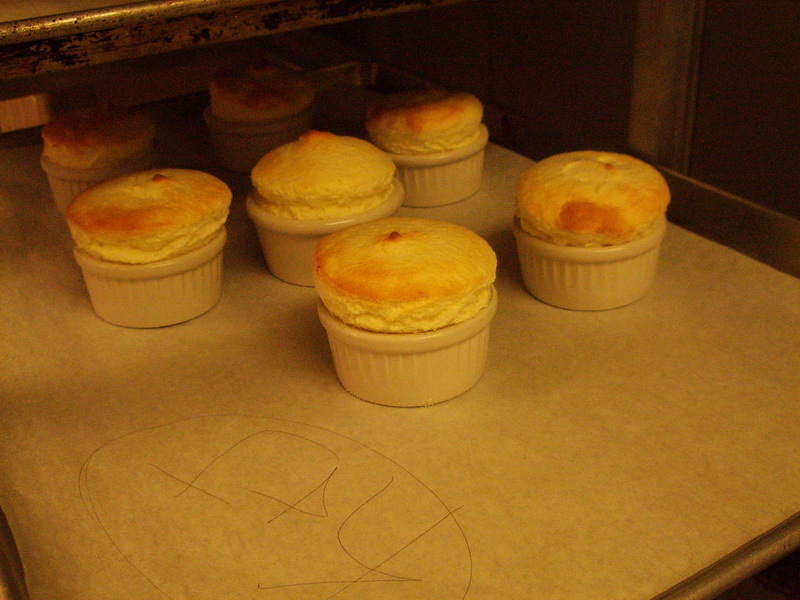 Later on, my partner told me to come over to the oven to look at our souffles – they looked wonderful! Here’s how they looked when they came out of the oven. They tasted delicious too – they had a beautiful texture and a nice lemon flavor. Before lunch, the group went to one of the baking and pastry classrooms, where the class was practicing production of desserts. We each had to order a dessert, pick it up from that station, and then eat it. No one was all that excited about this task! I picked the healthiest one, which was fruit salad with cherry sorbet, and it was delicious. Then it was on to lunch and we all skipped dessert. For our last hour in class, the chef made crepe batter and demonstrated making crepes and plating them. We all took a turn at making and plating crepes. Mine weren’t worth plating! And that was it. The chef had some closing comments, we all received a copy of our group photo, and then it was back to the real world.